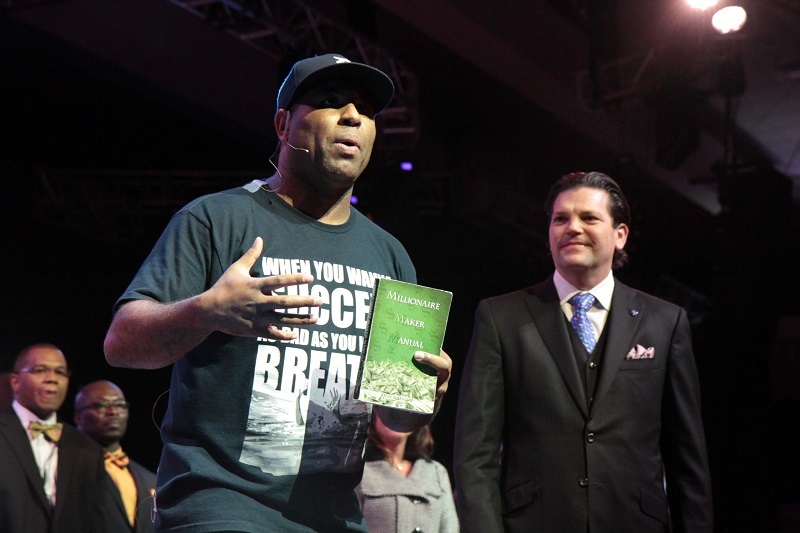 CHARLOTTE, N.C. – Motivational speaker and author Eric Thomas delivered the keynote address to National Agents Alliance at its “Fight To Unite” National Convention on Jan. 11 at the Charlotte Convention Center. Afterward, Thomas fielded questions from the audience. The Alliance has a transcript of the Q&A session transcribed below. Q: When you are up at 3 a.m., what are you doing and how are you doing it? Eric Thomas: A big part of learning is shutting up. What happens is, for a lot of us, we are so busy if you keep doing what you’ve always done you’ll keep getting what you’ve always gotten. A lot of times we think about that in a negative connotation and it’s not. If you keep doing the good that you are doing you are going to keep getting the good you are getting. So again, information is what takes you to the next level. You learn something new and then you apply it. One of the things I do in the morning is I just go walk. I just walk. Just for miles. And in my prayer I am silent and I’m listening. We were born with one mouth and two ears. They said we should listen more than we talk. For a lot of us, you talk too much. Every idea you have you want to talk about it. You get on the phone with a person and what could take 10 minutes is taking you 30 minutes because you are talking too much. I’ve learned to shut up and listen. That’s what I’ve learned to do at 3 o’clock in the morning. The stuff that I hear while the dew is still on the roses is stuff that I hear that takes me to another level. I might hear get your wife roses today or take your daughter to lunch today. If you are learning, listen. People have already done it, they’ve already been there and you don’t have to make the same mistakes. You don’t have to invent, you can be obedient and follow the path and get to where we are a lot quicker than we got there. Q: You just broke me in the back. Now, I’m empty. Where am I going? Eric Thomas: Personally where you go is whatever. I’m a Christian, so my rock is Jesus. I go everywhere with Jesus. Right? You go to your upline and you tell them this is where I am. You can go to them and they’ve been where you are right now. They can say to you, ‘This is the point that you are at.’ I’m a runner, so if you run long distance after a mile or so your body is going to be feeling like this or telling you this. But there’s a second wind and if you can get past that point, you can run another four or five miles off that second wind. Then, there’s some cramping, so go to the people that are in your upline and speak to them or talk to them. Whatever your source or rock is, whoever your mentor is go talk to them. In General, if you don’t have us, go to whatever your rock is, your support go there. Don’t stay. Empty is great, but don’t stay empty. Now you have room to put some new stuff in. So, you are ready. Q: How do you learn to stop asking the dumb questions so you can get to the smart questions to move forward? Eric Thomas: No question is dumb, but there are questions that are not going to get you to the next level. You got to get around those people who have answered those questions, who’ve gone through that process. You’ve got to get around them. You’ve got to get away from the noise. Those negative people, those people who are not believers, who are not pushing you in the right direction, you have to get away from those people. There are books, series of books, audio books, conferences, my God. I don’t know if you know what you are doing right now, but most of America is about to watch some game. Most of America is about to do something entertaining. They are not blessed to be in this environment, so this is a beautiful environment. You know the people who are at another level. You do whatever it takes to get around those people. It’s here, you don’t have to do anything. It’s here. You have to be intentional and deliberate about not only getting in their space and getting the information they have. Once you get the information, boom, you are going to take off from there. Q: When you were a high school dropout and then got your GED, what inspired the change, what made you want to change and go on this progression of learning from dropping out of high school? Eric Thomas: I started going to church and it’s not religious but when I started going to church, this sermon was called my people appearance because of a lack of knowledge. I was like that’s my problem. My father was a dropout, my grandfather was a dropout and I just followed that pattern of ignorance. That’s no disrespect to my father or my grandfather, but I followed this path of ignorance. What if I started this other path called knowledge? It’s the craziest thing. The first book I ever read in my life was called Gifted Hands by Dr. Ben Carson. Somebody gave me a book and I didn’t want to read it. He was a doctor and I’m a high school dropout, we have nothing in common. They told me to just read the first couple pages and then you can put the book down. They set me up. I read the first page and it said his father left him when he was a kid. I kept reading and it said he was from Detroit, Michigan. I kept reading and it said he didn’t do well in school. After I read the book and put it down, it was like I had been in a dark room and a light came on. My life was dark and I read all the way through the book and boom! The light came on and I started to see light. Q: You speak with so much passion and intensity, where does that come from and how do I catch that? Eric Thomas: Maybe you need to take a trip to a third-world country? Maybe spend a week in Haiti where there is absolutely no opportunity? I don’t care how fired up you are, how passionate you are, how much energy you have, there is just no opportunities. Then, come back to the United States of America where there are opportunities. I’m not making America a perfect place, but let me tell you something, when you compare America to other places, man, the opportunities are endless.